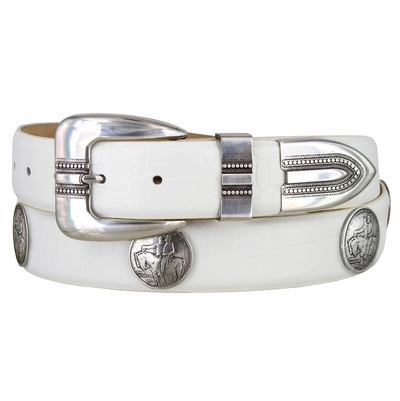 Silver plated 3 Piece Buckle set adorned with 5 coin conchos replica shown on a Fine Italian Smooth Calfskin strap. Lined with soft Genuine Leather 1 3/8" wide. Sizes Available from 32" thru 54". Size measured from where the leather ends at the buckle end to the middle hole at the tip end.